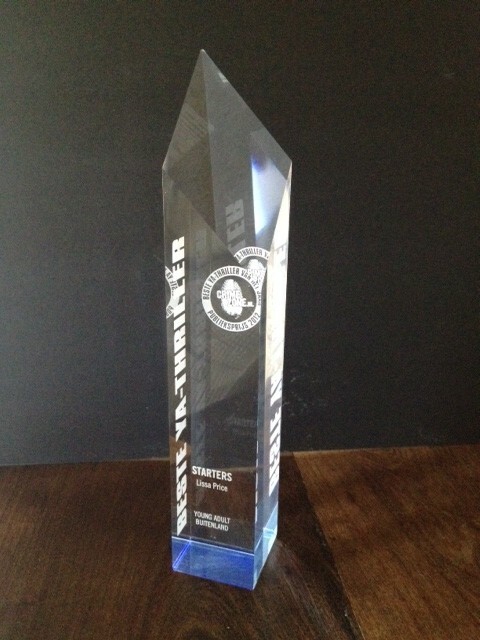 Finally, the Crimezone Award Trophy for Best YA Thriller has landed in the US! It’s so beautiful, tall and dangerous, I love it. It’s also the first trophy I’ve ever won, let alone for my first book so I am very proud of it. Thank you, Unieboekspectrum in the Netherlands for your ethereal version of the original cover. This pic has the award sticker on the shrink wrap and underneath is a translucent vellum cover that makes Callie’s drawing look hauntingly ghostly. It is a wonderful interpretation, whoever did that was a genius. Thank you, Crimezone, for designing this spectacular award. Previous Post: I’m Back. Oh no! It’s beautiful, Lissa! And so well deserved. Congratulations, again! Thank you! I’ll bet that cover is expensive because it’s fragile (hence the shrink wrap around each copy). But even prettier in person.